Diabetic nephropathy is kidney disease that is a complication of diabetes. It can occur in people with type 2 diabetes, the diabetes type that is most common and is caused by resistance to insulin, or in people with type 1 diabetes, the type that more often begins at an early age and results from decreased insulin production. Diabetic nephropathy is caused by damage to the tiniest blood vessels. 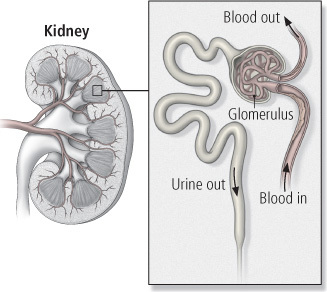 When small blood vessels begin to develop damage, both kidneys begin to leak proteins into the urine. As damage to the blood vessels continues, the kidneys gradually lose their ability to remove waste products from the blood. Up to 40% of people with type 1 diabetes eventually develop significant kidney disease, which sometimes requires dialysis or a kidney transplant. Only four to six percent of all type 2 diabetes patients end up requiring dialysis, although about 20% to 30% of people with type 2 diabetes will develop at least some kidney damage. About 40 percent of all people who need to start dialysis have kidney failure from type 1 or type 2 diabetes.